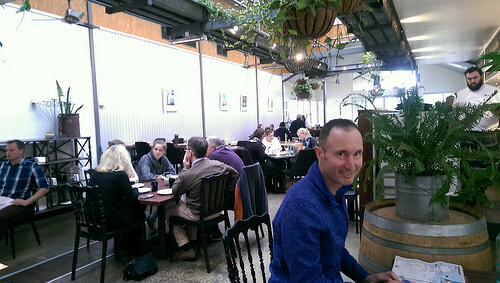 Top attractions Yallingup Margaret River visit premium wineries and art. 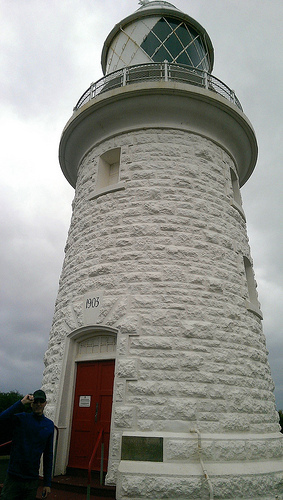 After first basing ourselves in Bunker Bay, we visited the Cape Naturaliste Lighthouse. The wind’s been fierce today, but it was a pretty easy 5-min walk from the lighthouse reception area. It’s really hard to photograph lighthouses, when you’re trying to stay on your feet. Time to move on to the top attractions Yallingup Margaret River. 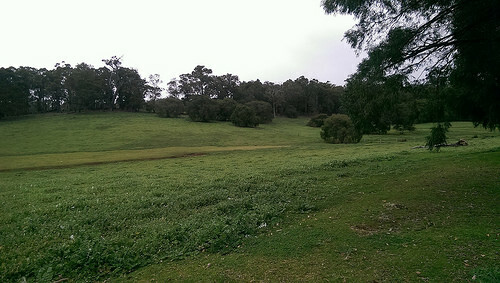 Most peoples perception of Western Australia is that of arid dessert land but within the Margaret River area there is much greenery and gentle rolling hills. Some of the top attractions of Yallingup Margaret River are the Gunyulgup Galleries. 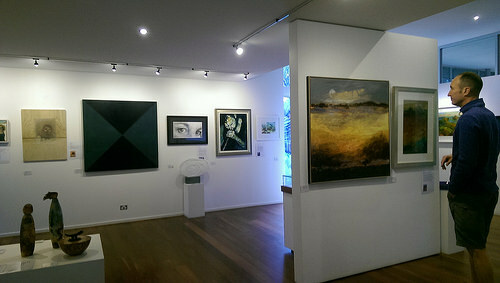 We liked The Studio Gallery which featured beautiful collections by leading Australian artists. For a really special purchase, this would be a good place to start. Ths photo only shows a fraction of what is available. The larger paintings are displayed in pull-out sliding doors and they are stunners. 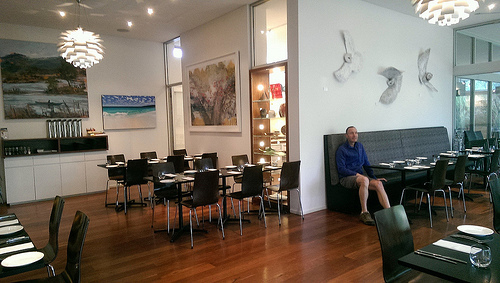 The beauty of this art gallery is that it incorporates an award-winning Bistro Restaurant within a bush setting. That makes total sense – great food and art make good companions. Sorry Michael, we have to move on, there’s so much to see before we stop for lunch. 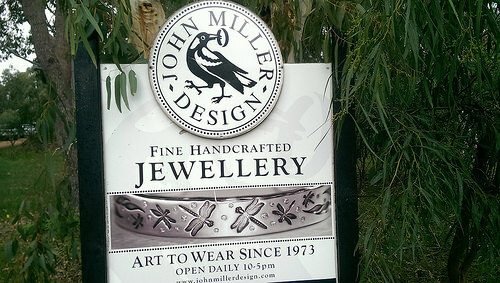 Next stop is at a smallish handcrafted jewelry gallery featuring original and eye-catching silver jewelry. You’ll have no problem finding these places – they’re in close proximity to one another and everything is well signposted. You couldn’t possibly miss this sign. 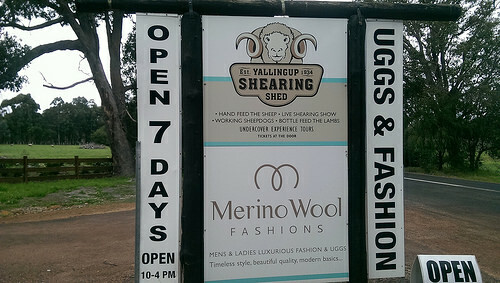 Bought myself a pair of Merino wool socks here. There are wineries galore here and quite a few stand-outs. Vasse Felix, Cullen Wines and Hay Shed Hill are just a fraction wineries producing award-winning wines. We decided to lunch at the Hay Shed Hill Winery in their Rustico Restaurant. There is a very good reason why Michael looks so happy. The tapas style food was terrific. 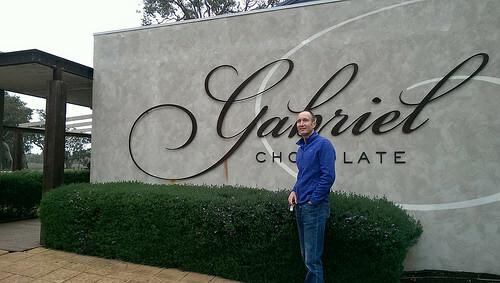 After our tapas, salmon pizza and pear & walnut salad, we rounded off the experience with a visit to the Gabriel Chocolate Shop. 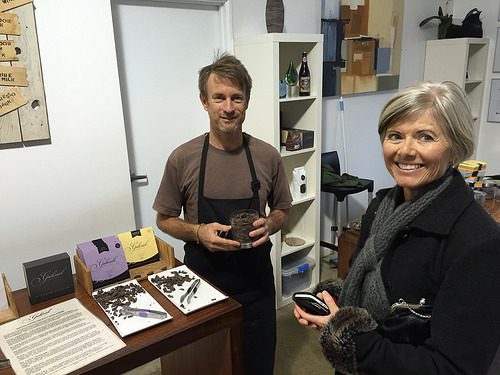 I have been accused of overworking the word “divine” but how else can you describe this “bean to bar” experience. Free sampling before you buy and so much choice. The friendly and helpful salesperson insisted on adding more meat to my bones by sending many samples my way. We left with 3 different varieties, all 75% dark chocolate. I’m not ashamed to say, there are only two left and the day is far from finished.